Sonic Rivals is a game created by Death, Jr. developers Backbone Entertainment exclusively for the PlayStation Portable. This is the first Sonic game to be developed by a Canadian company. The Sequel is Sonic Rivals 2. It features 2.5D gameplay, as players scramble to reach the end of a level before the other players do (whether they are computer-controlled or live opponents). It otherwise plays very much like the older titles in the series. 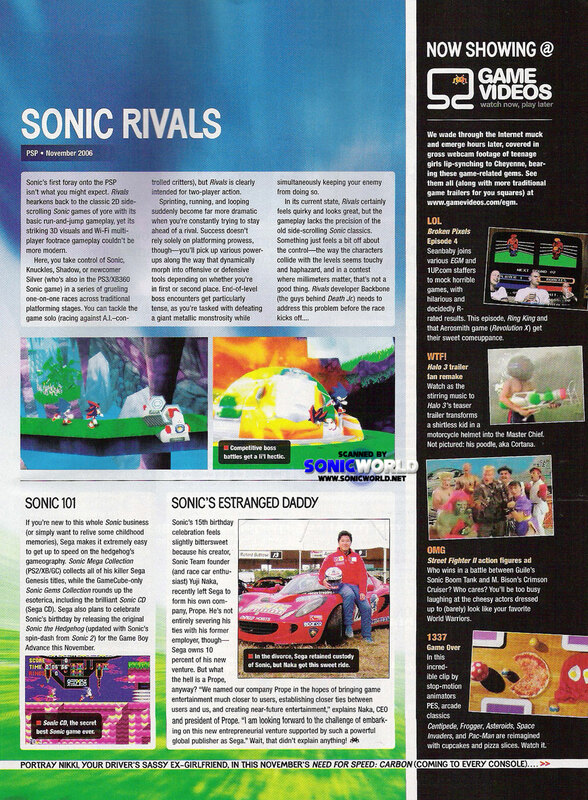 Sonic Rivals starts as a competition between Sonic and Knuckles, but expands as further rivals get added to the mix. Sonic the Hedgehog: The fastest thing alive. He's defeated Dr. Eggman to save the world numerous times, but in his latest adventure, Sonic discovers that his best friends Tails and Amy have been mysteriously turned into cards. Now it's a race to find that evil Dr. Eggman and free his friends! Knuckles the Echidna: Having lived his whole life on Angel Island, Knuckles' existence is spent guarding the Master Emerald. He’s a wild, strong, tough, and all-around stubborn kind of guy and, one may say, a rival to Sonic, perhaps due to Knuckles' longing to have a life of freedom like the hedgehog's. He must now race to find the Master Emerald that has mysteriously been turned into a card by Dr. Eggman! Shadow the Hedgehog: A black hedgehog that looks like Sonic, and has his abilities (speed, the most notable). He was created as the ultimate life-form by Professor Gerald Robotnik, the greatest scientific genius of his time. Shadow has the power to use the Chaos Emeralds to perform “Chaos Control,” enabling him to manipulate time and space. Summoned to a strange land by Dr. Eggman via a cryptic transmission asking for his aid, Shadow encounters something strange and now it’s a race to find Eggman to uncover the truth! Shadow's special ability is Chaos Control, which he can use to slow down his opponents. Note: The closer the rival is, the slower they are. Silver the Hedgehog: A mysterious young white hedgehog, equipped with psychic powers that allow him to propel items through the air with great force, is transported from somewhere. The only thing Silver really knows is that he is searching for someone…but for whom and more importantly why? Shrouded in mystery, Silver begins to run after Dr. Eggman to find the clues that will unlock his quest. Metal Sonic's special ability is the ability to copy the attacks of others, similar to that of Emerl from Sonic Battle, and also reminiscent of his play style in Sonic the Fighters, wherein he could use all the other characters' special attacks. Miles "Tails" Prower: Upon journeying to Onyx Island with Sonic, Tails is turned into a card by Dr. Eggman's camera as proof to Sonic that he indeed has the power to do so. It's now up to Sonic to save both him, and Amy, who has also been turned into a card. Amy Rose: The first to be turned into a card by Dr. Eggman's camera, Sonic and Tails journey to Onyx Island to discover this shocking truth. After Tails himself gets turned into a card, Sonic sets out to save them both. Rouge the Bat: After discovering the truth about "Dr. Eggman", Rouge goes missing but it is later revealed that she was turned into a card. Shadow sets out to save Rouge whilst trying to figure out what she had discovered. Doctor Eggman: Eggman, in fact, isn't the troublemaker in this story. He is actually the victim. Eggman NEGA turns Eggman into a card before the main storyline actually occurs. Shadow retrieves a distress signal from Eggman when the game first starts, but Shadow then states it was sent 6 hours earlier. After Eggman is saved from Silver and Shadow, he helps them get into outerspace to stop Eggman Nega's evil plans. Eggman Nega: As it turns out, Eggman Nega is main antagonist of the game who hails from the future. Masquerading as Dr. Eggman in the past, he uses a special camera to turn everyone into cards on Onyx Island, an island he brought along with him from the future. His master plan is to change his destiny by turning the whole planet into a card that he can control. It is revealed that he was never an alter ego, but a descendant of Eggman. Egg Turtle - The boss of Forest Falls. Seen in screenshots of the boss battle, featuring both Sonic and Shadow. It attacks with its head and tail. Egg Destroyer - The boss of Meteor Base. The final battle of the game takes place on board a large rocket, which you will have to fight your way through Metal Sonic and various other obstacles to get to Eggman Nega's capsule. MonoClown - Jester robot that rolls on one large wheel and punches players in Sky Park. Egg Pawn - Another one of Eggman's robots, first seen in Sonic Heroes, often appears throughout the various stages. The playable characters are Sonic the Hedgehog, Knuckles the Echidna, Shadow the Hedgehog, Silver the Hedgehog, and Metal Sonic. Gameplay is similar to classic Sonic games, but now, keeping with the Rivalry Theme, players can jostle, trip and shove opponents around. There are 7 types of power-ups, fire, ice, mine, illusion, wind, ring magnet, and star. The effects of each one are different for each character, though generally have similar outcomes. For example : the Fire power-up gives the character a fire attack, the Ice power-up gives the character an ice attack, and the Star power-up gives the character a special attack specific to that character. The game features a revamped power-up system, including both offensive and defensive abilities. Single player consists of a Story Mode, in which each of the four playable characters have separate story lines, and must race each other to the finish line in each stage in order to thwart Doctor Eggman's various schemes. Multiplayer mode is played Adhoc, and players can customize their racers using collectible cards won in Single player, trade cards with friends, and wager cards on races. Badniks are featured as enemies, though some are similar to those of Sonic Heroes. Performing objectives throughout the game will give you collectible cards. Such tasks include getting a certain number of rings, hitting your rival a certain number of times and getting to the goal within a certain amount of time. A carnival level. First seen in the Leipzig Game Convention trailer. Carnival-like attractions appear throughout the stage to help you reach the goal; most predominantly, Roller Coasters. This Level only has two Acts and no Boss. You have to win the race against Metal Sonic in Act 2. An icy level. First seen in the Leipzig Game Convention trailer, this course appears to have many traps, one of which is a pit whereby opponents can push a boulder over any rival who happens to fall in it. Much like the catapult on the Coliseum Highway course, this stage features a bobsled you can temporarily use to proceed at a certain point in the stage. Not much else is known about it at this time. A level filled with machinery, fans and other varia. First seen in the Leipzig Game Convention trailer. Giving the player the feeling of navigating a construction area, the level is filled with ziplines, wrecking balls, flame torches, and oil spills. As in Sky Park, you have to win a race against Metal Sonic in the second Act. The name is thought to be an allusion to the "Spring Yard" stage from Sonic 1. An Eggman base hidden within an asteroid field. Holds Eggman's fiercest creations as well as hot lava; traps and mines abound in this stage. It bears a small resemblance to the Meteor Herd stage, from Sonic Adventure 2. In this final level of the story modes, the player will be assisted through both levels by two characters. Sonic is assisted by Knuckles and Shadow; Knuckles by Sonic and Silver; Shadow by Sonic and Silver; and Silver by Knuckles and Shadow. Sonic Rivals features an extensive collectible card system that spans a total of 150 cards, featuring cameo appearances of robots, major characters, minor characters, boxarts, and items from past Sonic games such as Sonic Heroes, Sonic Adventure, Shadow the Hedgehog, and even dating back to Sonic the Hedgehog. The cards themselves are used to unlock secret costumes for the characters among other things. This article is a stub. You can help SegaSonic Database by expanding it. This is the first Sonic game not released in Japan. This marks the first time Sonic, Shadow, Silver, and Knuckles wear actual clothing. There are 3 types of clothing for each character, the first is leather, which comes in different colors. The second is misc, which is a different style of clothing for each character, Sonic's is called Black Tie, Knuckle's is called Eggman, Shadow's is called 80's and Silver's is called Christmas. And the last is elemental, which represents different elements for each character, Sonic's is Ice, Knuckle's is Metal, Shadow's is Fire and Silver's is Lightning. This is Silver's first Handheld appearance. If Eggman NEGA were to turn the planet into a card, it's possible he wouldn't have been born, due to a logical reasoning of a paradox. If Eggman was still in card form, then that means Eggman must have already had a son for Eggman NEGA to be alive, due to a logical reasoning of a paradox. SegaSonic Database is a FANDOM Games Community.